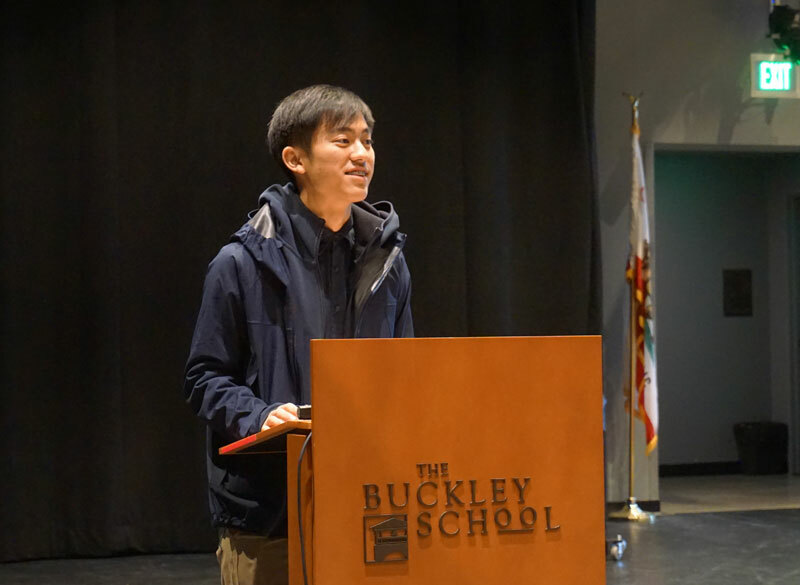 During his presentation at the “Literature &…” conference at Archer last year, Prep sophomore Leon Kuo ’21 gave an insightful and stimulating talk entitled Halfway, about growing up straddling two cultures—American and Taiwanese. 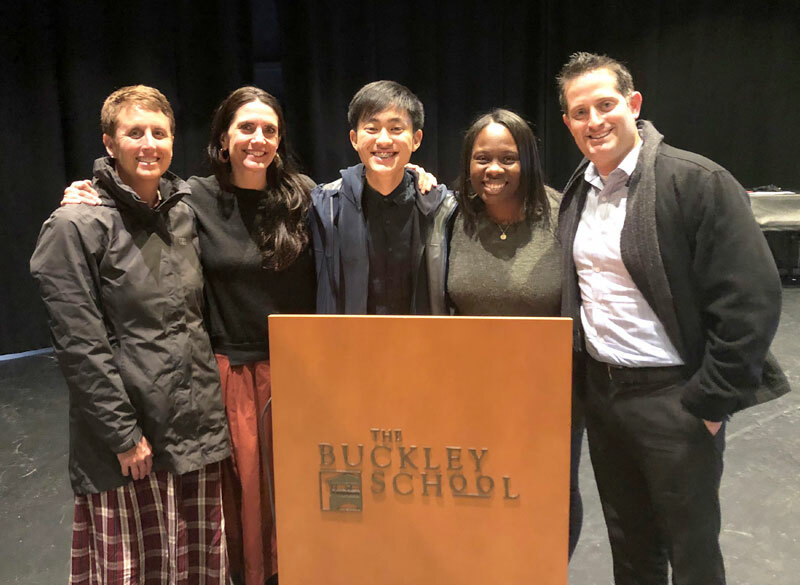 His talk was received so well at Archer last year that Michael Jaffe, an Upper School English teacher at Buckley in attendance, invited Leon to present Halfway to current Buckley students this year. Leon spent the December day talking with students in Buckley’s AP English and 9th Grade Human Development classes alongside Prep English teacher Tyke O’Brien. Halfway originated in Leon’s 9th Grade English class, where his assignment was to explore his identity through an object. “I am a foreigner in both Taiwan and the US,” he says in his introduction. Reflecting upon ways his perception of his identity has changed over time, he remembers seeing only the joy in being bicultural as a child, only to realize the challenges that come with it as he grew older. From being made fun of for enjoying Taiwanese food at his third grade lunch table to facing stereotypes about Asian immigrants, he remembers each deeply hurtful incident in detail. He knew other bicultural students must feel the same, and Mr. Jaffe at Buckley thought so, too. So he shared his feelings openly with the students at Buckley. Following his presentation, the group participated in a Q+A session and roundtable discussion, a memorable part of the day for Leon. Despite the challenges of being first generation Taiwanese American, Leon made a point to bring up the good that comes from growing up bicultural, as well. He told the story of how, in the same restaurant where he was labeled arrogant by complete strangers, he overheard two American tourists struggling to order food. He promptly went over to help them, where he ended up talking with them about being a bilingual “ABC” (American-born Chinese). The tourists asked Leon about his history and about growing up bilingual, and he talked about it gladly. “It was not my first time translating for someone, and it definitely won’t be my last,” he says. 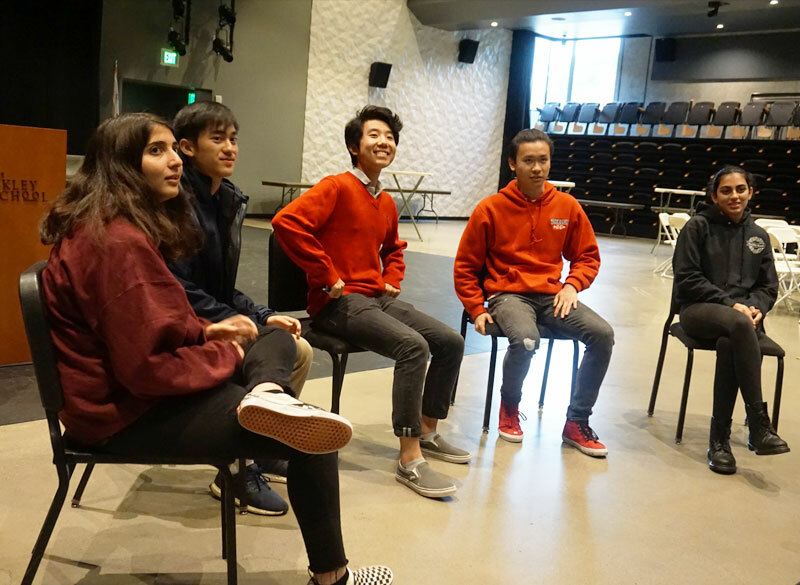 The talk is just one of many accounts that Prep students have given as part of Prep’s emphasis on student voices, global studies and multidisciplinary learning. At the end of January, 8th grade students’ thoughtful CIP projects at the STEAM & Service Fair reflect a host of diverse personal experiences, backgrounds, passions and interests—topics like immigration, sports medicine, feminism and mentorship of young children. Last year, Jeff Chan ’18 worked with Ingrid Herskind to create an interactive display in the library on migration, complete with immigrant authored books, personal accounts of immigration and a map station, where students could trace their own family’s immigration throughout history. Based in authentic connection and student autonomy, Prep’s curriculum and growing Global Studies program invite students to call upon their personal experiences like these to connect with others, teaching them that there is immense strength in collaboration and openness.